The beneficial health effects of fruits and vegetables have been attributed to their polyphenol content. These compounds undergo many bioconversions in the body. Modeling polyphenol exposure of humans upon intake is a prerequisite for understanding the modulating effect of the food matrix and the colonic microbiome. This modeling is not a trivial task and requires a careful integration of measuring techniques, modeling methods and experimental design. Moreover, both at the population level as well as the individual level polyphenol exposure has to be quantified and assessed. We developed a strategy to quantify polyphenol exposure based on the concept of nutrikinetics in combination with population-based modeling. The key idea of the strategy is to derive nutrikinetic model parameters that summarize all information of the polyphenol exposure at both individual and population level. This is illustrated by a placebo-controlled crossover study in which an extract of wine/grapes and black tea solids was administered to twenty subjects. We show that urinary and plasma nutrikinetic time-response curves can be used for phenotyping the gut microbial bioconversion capacity of individuals. Each individual harbours an intrinsic microbiota composition converting similar polyphenols from both test products in the same manner and stable over time. We demonstrate that this is a novel approach for associating the production of two gut-mediated γ-valerolactones to specific gut phylotypes. 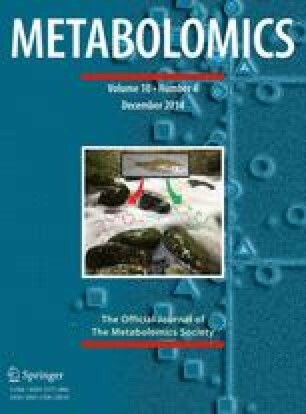 The large inter-individual variation in nutrikinetics and γ-valerolactones production indicated that gut microbial metabolism is an essential factor in polyphenol exposure and related potential health benefits. The online version of this article (doi: 10.1007/s11306-014-0645-y) contains supplementary material, which is available to authorized users. We acknowledge the financial support of the European Community under the Framework 6 Marie-Curie Host Fellowships for the Transfer of Knowledge Industry-Academia Strategic Partnership scheme, specifically GUTSYSTEM project (MTKI-CT-2006-042786). Part of this project was carried out within the research program of the Netherlands Metabolomics Centre (NMC) which is part of the Netherlands Genomics Initiative/Netherlands Organization for Scientific Research.